The development of individual behavior in dolphins acts to mold their social structure and how they cooperate with each other. They live in complex social societies. These societies differ dramatically between genders. In the wild, these developments may have evolved as a way in which dolphins could meet the requirements of their challenging and ever-changing environment. 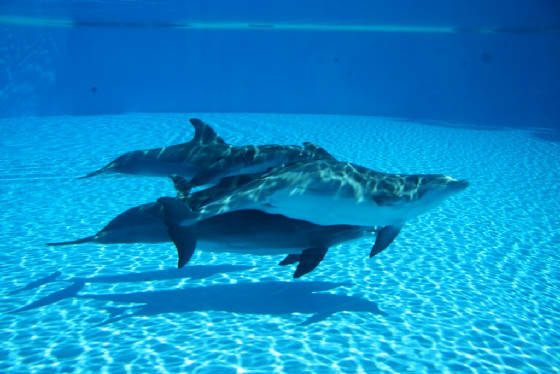 Yet in captivity, with its more stable and less challenging environment, dolphins exhibit the same collection of behaviors as those living in the wild. A dolphin spends a majority of its time and energy each day seeking out relationships. Its standing in its society is determined by its interactions with other dolphins. As its group composition changes, its rank and social standing may change. In the wild dolphins live in what is termed a fission-fusion society, meaning their group composition is constantly changing. The way in which these groups form and reform is influenced by a variety of factors including gender, age, familial relationships and reproductive status. Dolphins use sexual encounters (as many as 10 per day) as a means of affirming social relationships within their group. The study of dolphins has revealed specific behaviors are often associated with specific actions. An example of this is those behaviors associated with group travel. A communication to begin travel is often initiated by breeching (jumping out of the water and landing on one’s side). A communication indicating the travel is over is often done by upside-down lobtailing (rolling over to expose the ventral side at the water surface, lifting the flukes above the water, and then slapping them down onto the water surface). Such communication within dolphin groups has its rules, though. Only the dominant animals are allowed to demonstrate group control. In this example of group travel, breeching is almost always performed by males; upside-down lobtailing is almost always performed by females. After the nursing period (1-2 years), dolphins markedly reduce associations with their mothers and form long-term associations with other dolphins. Male calves exhibit such disassociation more quickly than do female calves. In forming new associations, the Bottlenose prefers to do so with animals of its own gender. This is most likely due to the differences in reproductive strategies between males and females. Females show less aggressive behavior between each other than do male dolphins. Male fighting skills, often practiced between juveniles, may be necessary in order to be successful at some time in the future in obtaining females with which to breed. Aggressive behaviors may include biting, teeth-raking, jaw-popping, fluke-slapping, head-butting and ramming. The outcome of aggression is dominance. Head-butting is a particularly aggressive behavior between two dolphins. A male ramming a female, although an aggressive behavior, it is usually associated with the initiation of sexual activity. Juvenile males and females exhibit social play. This play, similar to adult conflicts, may be practiced in order to provide the skill to respond to others and to predict how others will respond to them when they are mature and off on their own. It is also through these repetitive playful and aggressive behaviors that the social hierarchy and order of dominance are established. Dolphins rarely inflict long-lasting physical damage on each other. This would be counter-productive as it would remove a member from their cooperative group. Less aggressive behaviors such as gentle contact and contact swimming provide bonds between animals. Gentle contact between animals includes using the pectoral fin to pet or rub any body part of another dolphin. Contact swimming involves two dolphins synchronously swimming while one animal lays its pectoral fin on the flank of the other. This unchanging contact and synchronous swimming then continues over an extended period of time. Contact swimming is more often seen between females than between males. The prevalence of contact swimming between females may be part of a female’s nature to provide, as a new mother, assisted locomotion to its newborn (where the new calf swims rather effortlessly in its mother’s slipstream). Dolphins demonstrate a type of "grief" (I use this term at the risk of appearing anthropomorphic, or attaching human behaviors to animals) when family or pod members die. They often stop eating, become lethargic, distance themselves from and don't associate with other dolphins and become unresponsive. This behavior lasts for a few days, at which time they appear to recover and resume their typical activities, almost as if forgetting the event occurred. This is true even when a mother's calf dies.